10 Tips to Stay Warm this Winter! As well all know, autumn and winter mean colder days, intense weather systems pushing us to the limit of our physical abilities with big waves and big wind, sending it bigger than any other time of year. 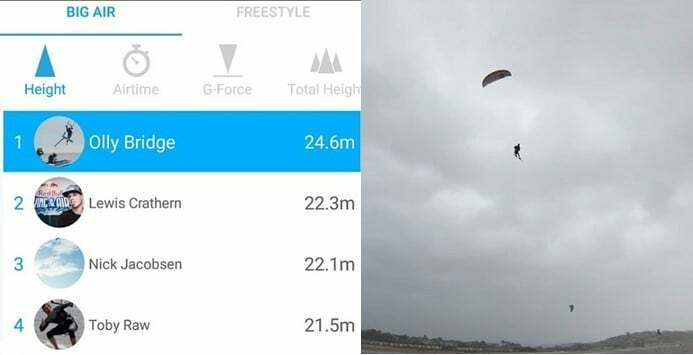 Nobody knows this better than the UKs very own big air kitesurfer Olly Bridge who’s just set the biggest UK kitesurfing jump record at 24.6m!!! However, this is also the time of year when unfortunately we have to start thinking a little more carefully about how we can stay warm whilst doing what we love. So, here at the Kitesurf Centre we’ve put together our top 10 tips to keep you riding through the cold days to make sure you get your fix when you need it most! 1 – Get a good wetsuit. This is by far the most essential piece of equipment to keep warm throughout the colder months. During the summer you may be used to wearing 2 or 3mm wetsuits which are great to keep you at the right temperature when the air is 18°C+, yet will be useless when the water barely reaches 7°C and the air is even colder! 5mm wetsuits are far superior at keeping your core temperature high, whilst still providing plety of flexibility to minimise motion loss! 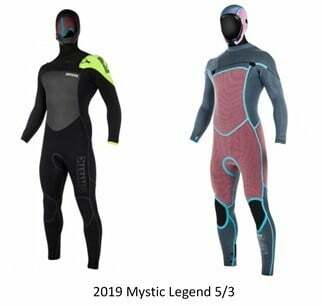 The 2019 Mystic Legend Chest Zip 5/3mm wetsuit is an example of a top end winter wetsuit with all the newest technology and features for maximum warmth and minimum cold water seepage. Check out the link for the full spec! 2 – Protect your extremities. Yep, we know, wearing boots and gloves isn’t the best way to feel your board and have full connection to your kite. But unfortunately unless your hands are made of fibreglass they will get very, very cold. As your feet are in contact with the water the most, your feet will also feel the cold the most. Wrap them up in warm thick booties and your sessions won’t be as short lasting as you are in the sack! Thick gloves are great for keeping your hands warm throughout the cold sessions and hoods protect your head from the dreaded ‘ice cream headache’! Here’s a where you can find of all the gloves, boots and hoods we have for sale! 3 – Build your tolerance. There are many ways to build up cold tolerances, but particularly for kitesurfing, cold tolerance in your hands and feet will help the most. One particular method includes leaving a bucket of water outside your back door and throughout the cold winter every morning dip your hands/ feet in the bucket for as long as you can. If you do this every morning, you should feel the cold far less than before you start practicing this. However, if like the most of us you’d prefer not to have to go through this experience, refer back to tip 2. Warm water is ideal for kitesurfers, meaning you don’t have to worry about keeping your body temperature up with thick neoprene. However the best thing to do when the warm water disappears from the UK shores, is take it with you! Fill up a few bottles with warm water before you head out and place into insulating bags in your car. This way, when you get back out of the water, you can pour the warm water down your wetsuit before you get changed and also onto your hands and feet to defrost a little before warming back up at home! 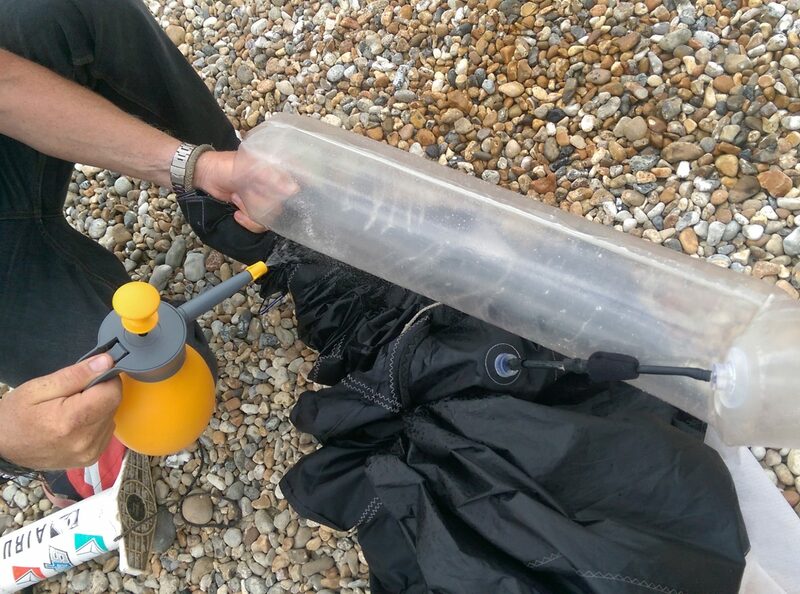 Other options are pouring water into your wetsuit before you get into it for a lovely warm entry, or even packing your pants and socks in with the bottles to keep them warm whilst you’re out on the water! Alternatively, if taking the warm water with you isn’t going to cut it… go to the warm water instead! We’re running trips to Egypt and South Africa this winter and we promise that it’ll be warmer there than it will be in the UK in November and January! Check out our page here for more information on our Kitesurf Holidays! 6 – Make your changing experience as pain free as possible! By far the worst part of winter kitesurfing is getting into and out of your wetsuit in the car park. To make this experience as painless as possible grab yourself a changing poncho from our Mystic poncho range. The current range includes the deluxe changing poncho which also has a water and windproof outer layer to keep you protected underneath! Another tip to keep yourself warm this winter is to completely eliminate the changing in the car park experience and get changed at home before you get to your car, or get into your car in your suit and get changed once in the shower at home. Although, sitting in a car seat in a wetsuit sounds like a bad idea, so you can cover up your seats with Mystic and Northcore seat covers. Take a look here. 8 – Get a hot drink at Tatner’s! 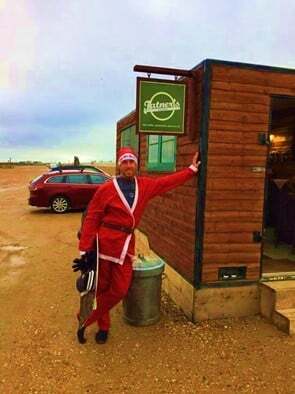 Luckily enough, down here at Camber Sands we have a delicious food and hot drink hut run by Tatner’s Kitchen serving hot drinks for your post session defrosting/caffeinating requirements! You just have to be extra nice to them for opening when it’s super, super cold! When going out in the winter, the cold will sap more of your energy so you need to make sure you have correctly fuelled up before your session! Complex carbohydrates such as oats, bananas and nuts are the best things you can eat to prepare yourself for a long winters session. Winters can be rough, so make sure you have the experience required to head out in the conditions we experience around this time of year. A general rule of thumb is to make sure you do your first 25 hours under 25 knots and then be cautious when heading out in windier conditions. Also make sure you have checked your equipment and also check the conditions including wind, tides and sun times to make sure you’re not caught out in the dark! Let’s face it, kitesurfing is an expensive hobby, so you want to make sure your kit lasts as long as possible. 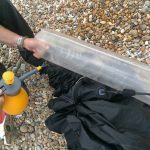 Although it may seem like a chore at the time, the best way to ensure your kit lasts as long as possible is to maintain and store it properly. 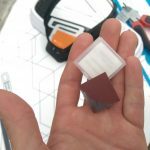 We’ve gathered some top tips for kit maintenance from our instructors, to help you get the most out of your equipment. And for those occasions where something goes slightly wrong, we’ve also included some tips on making small repairs. Should you need something more major, we offer an equipment repair service. Pack up your kite as soon as possible, especially in strong winds. A FLAPPY KITE IS AN UNHAPPY KITE. Pack your kite away FULLY DRY – if you cannot dry it straightaway, be sure to unpack it and dry it out as soon as possible. KITES LEFT WET WILL GET MOULDY. Yep, guess who is now able to get up and ride 10 – 15 metres to her right (only 2 metres to her left, but sssshhh) and THE BEST TIME EVER doing it?! You guessed it, me! And for all you wonderful people out there who have been following my journey, and for those who have had a laugh watching my many failed attempts, our lovely instructor Paul filmed it for us! After feeling like I’d made really good progress when I went out with Rupert I wanted to make sure I didn’t leave it too long before my next attempt so as not to forget everything I’d learned. As luck would have it just a couple of weeks later we struck gold, a lovely sunny day with plenty of wind and nice small waves. More wind meant not having to pump up a 17 metre kite, yay! 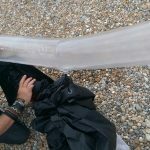 After a site assessment and setting up the kite we headed down the beach and I chatted to Paul a bit about what I’d achieved so far. The great thing about having private lessons is that you can go entirely at your own pace and work on whatever you’d like, rather than following a set lesson plan. I mentioned I sometimes struggled with rolling up towards the kite when doing my board starts, so Paul suggested we try working on that on the beach, with him gently tugging on my leash to give me the feel of the kite. After a few attempts I was a lot closer to standing up so we headed out into the water, which was a lot warmer than I thought it would be! Because of the lack of wind when I’d gone out with Rupert, he had held the board to help me get into it so that I was ready to go as soon as there was enough wind. Since we had enough wind this time, Paul said he wouldn’t being do that, and I’d have to learn how to put the board on myself whilst holding the kite! This genuinely terrified me. How was I supposed to float in the water and put the board on without diving the kite and getting dragged away?! In fact, it’s actually not that bad. I’ll admit I definitely struggled the first few times but after a while you learn to “feel” what the kite is doing without looking at it so you can focus solely on getting the board on. By the end of the lesson I had no issues in getting the board on pretty quickly each time, something I was actually quite proud of! The “rolling up” to standing position was definitely the part I struggled with the most. Whilst I’d heard many horror stories about students “superman’ing” over the front of the board (shout out to my friend Shannon who managed to release the safety AND lose a contact lens in the process!) I seemed to be going the other way, being too timid with standing up and ending up sitting back down in the water. The best tip Paul gave me was to try and get my head to my knee. For someone as unflexible (is that even a word?) as me that sounded ridiculous, but aiming for that did sort of force me to try harder with the motion of getting up. The great thing about Paul as instructor is how genuinely patient and encouraging he is. Every time I tried to get up on the board, he was right there with me, and didn’t get frustrated with me at all. He was really good at giving me a small thing to focus on each time, but also at knowing when I just needed to try a few times without any inpiutAs the guys who own the centre will tell you, I am a perpetual worrier. It’s difficult not to worry that your instructor is bored (and freezing!) whilst it takes you what seems like 5387 attempts to get up on the board. I have to give it to every instructor I’ve had so far – you can tell they love their job and don’t mind at all if you don’t get things right all the time. Massive thanks to Paul, Rupert, Jen and Samina for putting the time in with me! If you’re nervous about trying kitesurfing because you think you’ll struggle, I’d honestly say just go for it! The most difficult thing I found when first attempting the board starts is how much you have to think about, so it was useful to focus on a small part of it each time I tried, until eventually I could put it all together. Because I’d spent some time flying powerkites in between my lessons and had also had a kitebuggy lesson at the centre last year, I found the kite control part of the board start manoeuvre quite easy. If you’re struggling with controlling the kite or feel quite nervous with it, I’d definitely recommend having a play on something like a Peter Lynn Impulse Trainer – they’re super easy to launch even on your own and I’m much more confident with kites thanks to them. I came back in with a huge grin on my face, happy that I was even closer to being able to kitesurf independently. I can’t believe that in just 4 sessions I’ve gone from learning how to fly a power kite to getting up and riding along without looking like I’m completely out of control! Now it’s getting to winter and we’re a little less busy I’m hoping to get out another few times, but I’ll be wearing a jacket, booties and gloves for sure – being in just my 4/3 is a little brave for December! Luckily we have a stash of super warm stuff for students throughout winter so I’ll be raiding that! When looking to take lessons or become a kitesurfing instructor, you may find yourself choosing between the BKSA or IKO. To give you all the account of each organisation and what they offer, we’ve drawn up a comparison below. The BKSA (British Kite Sports Association) is the governing body (non profit) for all things kiting in Britain. They run all the training schemes, from grass roots to coaches. They are one of the most respected organisations world wide and set the bar in terms or quality and integrity. All BKSA schools have BKSA trained and qualified instructors who continually have to re-validate, update and pass assessments to keep their qualifications valid. The schools are inspected regularly by external examiners to check the equipment is in good condition and they are abiding by the strict guidelines set by the BKSA. It’s an official governing body for Sport England and therefore ticks all the relevant boxes in accordance with this. One of the main aims for the BKSA other than training are the grass root schemes for kids and the racing events, which eventually may be used for the qualification for the Olympics. The VDWS is the German counterpart and one of the other internationally recognised governing bodies. The IKO (International Kiteboarding Association) is a privately owned company based in Cabarete, Dominican Republic. The IKO was set up as the sport began and became the leading organisation as the sport developed in the late 90s. As the sport became more mainstream, most developed countries created governing bodies to take the sport forwards and develop nationally. In terms of schools and instructors, the IKO differs to the BKSA, it follows a similar course and to become qualified but once qualified the instructors are left to their own devices. They have to keep a log of their students email addresses online (which they pay for) and a revalidation is an online quiz every couple of years. The schools pay an annual fee to become IKO approved but are never inspected as the organisation is in the Caribbean and it’s the schools choice whether to carry out risk assessments and follow standard operating procedures, all of which are strict procedures for any BKSA school. Our verdict – Stick with the BKSA or a governing body for whichever country you’re in. The IKO is run as a profit making business with disregard for quality and safety. Kite schools and instructors can’t be assessed with an online tick box test every 3 years and often the kit is totally inadequate within the schools as they’ve never inspected and never will be. The IKO has been banned in several countries already and will likely be in more in the future. Don’t get us wrong, the BKSA has it’s flaws as well and can be improved in certain areas but the training side and structure of the governing body is spot on. An example of the quality of IKO instructors is someone who came for a job interview with us and claimed he had never done a self rescue / deep water packdown. This is a method used to get yourself safely back to the beach if everything goes wrong when out on the water. It’s something any BKSA school would teach on the very first day of a kitesurfing lesson and all BKSA instructors are trained to both teach it but also how to rescue someone who has begun one, either on a boat or kite. To say we were shocked was an understatement! The IKO has it’s place in under developed countries as a governing body isn’t available, so it’s better than nothing, but anywhere else it’s inadequate. From a potential instructors point of view, the qualifications gained are also something to consider. We would suggest first deciding where you want to instruct. The BKSA qualification is recognised worldwide and we’ve never had an instructor declined a job because of their qualification. The IKO is recognised worldwide and as previously mentioned, in less developed countries it would be no problem picking up work. However, for a lot of countries it is becoming a banned qualification and may cause problems. *Since writing the initial comparison it should be noted that the IKO has been banned in several countries now as the national governing bodies look to take control of their beaches and prepare for their entries to the next Olympics which require a governing body and training / coaching structure in place. Nobody wants a leaky valve but unfortunately with time, it happens… This is where the valve peels away from the bladder as the glue deteriorates and will result in a slow puncture. This is often discovered when looking for a puncture or if you wiggle the valve and hear a hissing noise. 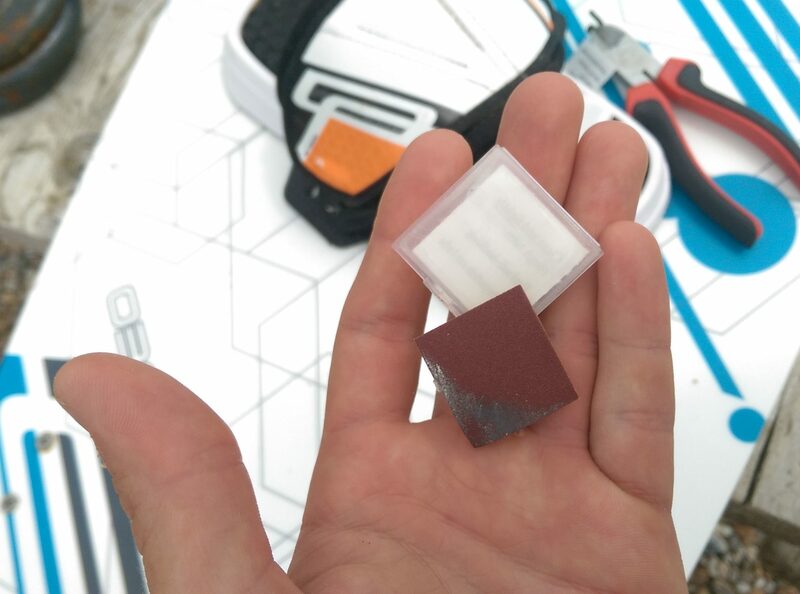 Spare valves are sold at The Kitesurf Centre (£9.99) which already have and adhesive applied to them, just like a puncture repair patch. This saves buying a tube of Aquasure glue and makes for a quicker job with no drying time. However the whole process is outlined below in 10 simple steps for a standard valve replacement. Locate the leaking valve either by sound or if you can’t hear it, use bubbly water like you would for a normal puncture (Check previous post). Remove the bladder with the leaky valve. If it is on a one pump system, then remove the connecting tube if needed. Again, DON’T forget to tie a long string onto the valve or bladder if you need to remove the strut completely. Then you can pull it back through easily. If there is only a small leak then you can leave the valve in place and bung up and glue over the hole with Aquasure glue, however it is usually a sign that the rest of the glue is about to go too. If it is a large leak or you want to redo the gluing, remove the valve. It may be easier to heat it up using a hair drier first. Clean and sand the valve and bladder where it was attached. Apply a thin layer of glue around the base of the valve. Squish it back into place, making sure the bladder isn’t stretched or crumpled underneath the valve. It is best to put it on a flat solid surface for this and leave it here for drying. Apply pressure on the edges of the valve; an upside down shot glass normally does the trick. Weight it down and leave it to stick for 6 hours. Put the bladder back in and make sure there are no twists. Inflate and test. If you kitesurf I’m sure you have or will run into this problem at least once. Learning and progressing your riding naturally comes with a few extra spills. Thankfully, punctures are super easy to fix. It’s just like riding a bike (literally) – bike punctures. 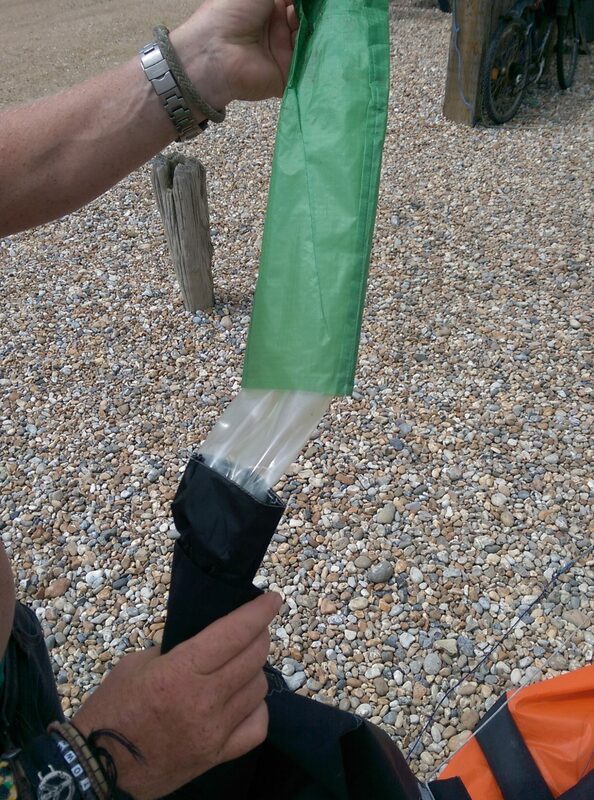 Kite bladders are just like massive bike inner tubes. 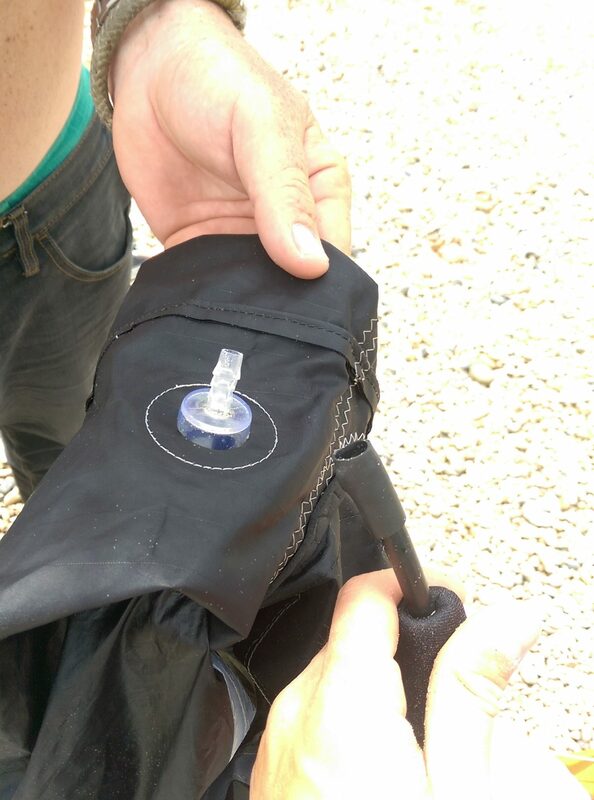 If you can fix a bicycle puncture then you can fix a kite puncture no problem. 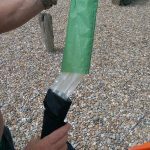 Inflate your kite to the normal pressure. Locate the puncture – This is the hardest part and can drive you crazy! Use a sponge with soapy water and run it over the leading edge, struts and the valves – Look for bubbles growing. Once you have located the approximate area, remove the bladder. Depending on where the puncture is located, the best way to remove the bladder differs. 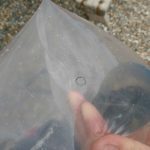 You can either undo the end of the leading edge or the strut, then pull the bladder out or alternatively you can remove the bladder through the zip if this is closer. You may need to disconnect the valves and pull them through too. If you are removing the whole bladder DON’T FORGET to tie some line to the end so you can pull it back through later. Once the punctured section of bladder is out, pump it up but DON’T over inflate. Run the sponge over it again or dip it in a bucket of water to find the hole. 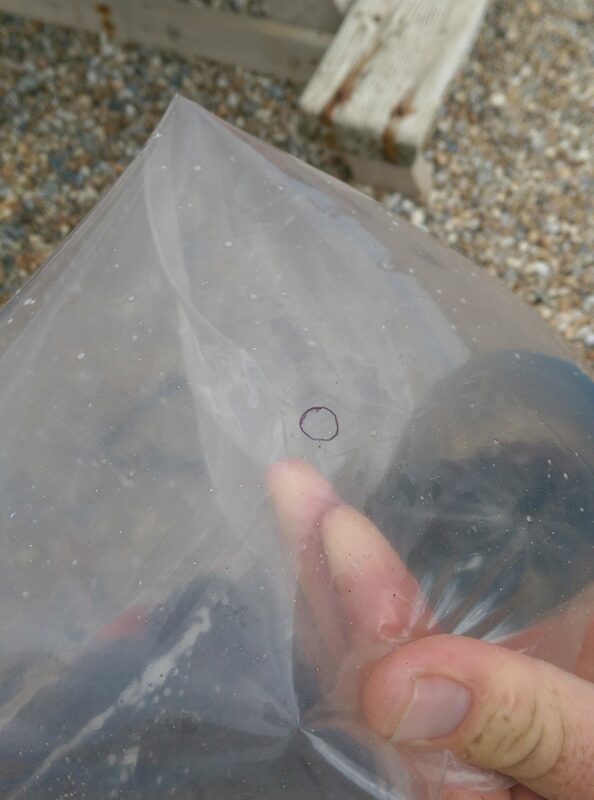 Mark the hole with a biro. Clean, dry and lightly sand the hole using the sandpaper in the kit. Lay the bladder flat on a hard surface, peel the back off the repair patch and stick it on If it is cold, use a hairdryer to help the glue stick. Put the bladder back in as it came out and pull the valves back through the holes. 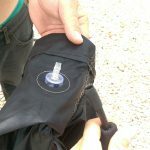 Make sure that no bladder is trapped between the valve base and the kite material. Inflate the kite slowly, looking for twists in the bladder. Sort these out if they occur. You might have to take it out and do it again until it is flush. Repeat step 2 and leave inflated for a few hours to see if puncture is fixed. As well as the forecasts it also has a huge amount of information about past weather averages which is quite interesting to look through.